Since its seemingly recent arrival on the world stage, the Islamic State, or IS, has set itself apart even from other radical groups in the Middle East. In short order, it has become perhaps the most pressing security concern in the region, a powerful and unpredictable new kind of jihadi threat with a reputation for exceptional public brutality, slick propaganda, and military success. But observers have also noted something else: a surprising level of structure. The group takes a bureaucratic, systematized approach to maintaining power that makes it look in some ways more like a settled government than a fly-by-night band of extremists. Whether under the flag of the Islamic State, or ISIS before that, the group organizes the territory it administers into well-defined geographic units, levies taxes in areas it controls, and manages large numbers of fighters across a sparsely populated territory roughly the size of the United Kingdom. Its formal administrative capacity is a substantial strength, one inherited from its predecessor organizations, Al Qaeda in Iraq, or AQI, and the Islamic State of Iraq, or ISI. It also has an important side effect: It creates a massive paper trail dating back years, long before the group’s current incarnation, which is only just beginning to be studied. Our team has analyzed 144 of AQI’s and the ISI’s own financial and managerial documents. Captured by coalition and Iraqi forces between 2005 and 2010, these include scans of typed documents, as well as electronic files found on hard drives, USB sticks, and other media. Among them are spreadsheets listing the qualifications and training of hundreds of fighters, details on thousands of individual salary payments, and massive lists of itemized expenditures. There are also instructions outlining geographic areas of responsibility for subunits, memos suggesting minor changes to organizational structures, and periodic management reports of all kinds. These documents were recently declassified by the US military and cleared for release as part of the Combating Terrorism Center at West Point’s Harmony Program. They represent an important window into how a group like the Islamic State works, and potentially offer hints about how to stop it. 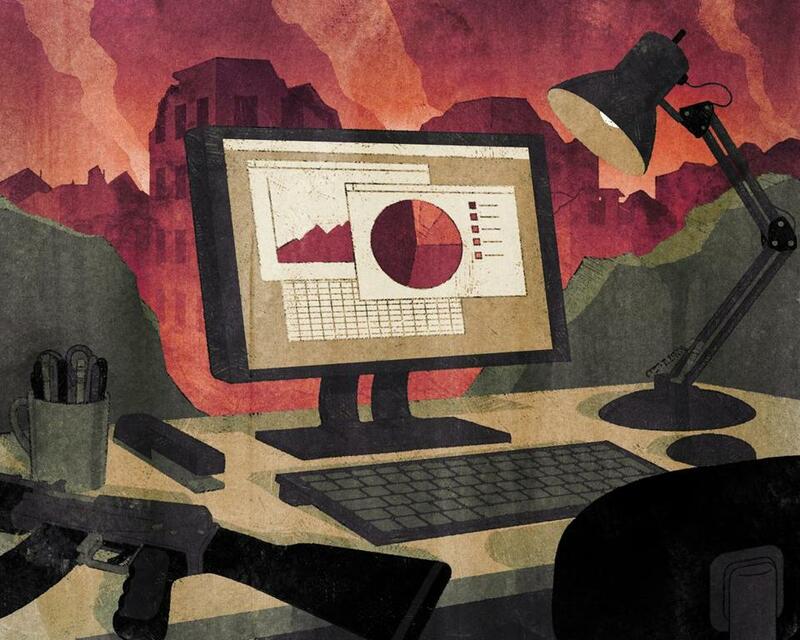 Despite their extremism and disruptive violence, groups like IS operate much like the normal organizations with which we are all familiar: They require revenues, they have expenses, and they need to make payroll every week. When you look at them in that light, you start to learn some interesting things. Their organizational templates are very persistent over time, for instance, suggesting that even radical groups cannot readily adjust to changing circumstances. And the economics of terrorist wages are surprising. Fighters earned terrible salaries for an exceptionally dangerous job, telling us that either the group had a large supply of potential fighters or that it felt the need to screen out people who were not ideologically committed enough to risk their lives for very little money. Our analysis paints a vivid picture of how the ISI worked, how it paid its people, and how it survived under tremendous pressure. For more information: On Monday, the Combating Terrorism Center at West Point will publicly release a new report on the Islamic State, a report on its predecessor organizations, and an archive of 159 insurgent documents from Iraq. They will be available at www.ctc.usma.edu. The group known as the Islamic State is the result of several rebranding efforts. It first surfaced in 2004 under the name Al Qaeda in Iraq—not actually an offshoot of Al Qaeda central, but a local extremist group that raised its profile by affiliating with the more famous organization. Even at this early stage, it was known for wanton violence against political leaders and use of armed robbery and theft for fund-raising. As its local reputation worsened, and as it sought to align with other groups, it renamed itself the Islamic State of Iraq. Thanks to US and allied forces, local Sunni militias, and Iraqi forces, the ISI was routed from most of Iraq and went all but dormant by the beginning of 2010, while maintaining some supporting infrastructure around the city of Mosul. It began to revive when the Syrian civil war broke out, at first sending fighters into Syria under the banner of another group, and then under its own banner. It changed names again—the Islamic State in Iraq and al-Sham, or ISIS—and reinvigorated its terrorist activities in Iraq. In June 2014, the group took control of Mosul, Iraq’s second-largest city, and renamed itself the Islamic State. Their documents show that many of the IS leaders had also been prominent in the ISI, including IS leader Abu Bakr al-Baghdadi, who took over ISI in May 2010 after serving on the group’s Shura Council. We believe that al-Baghdadi also shows up in a personnel-tracking spreadsheet from Mosul in 2009, listed under a previous nom de guerre, Abu Du’a. Five other prominent IS leaders also appear to show up in the same tracking sheet. Organizational cultures are notoriously hard to shift, and therefore what the group did between 2005 and 2010 should be able to tell us a great deal about the IS today. The ISI model was successful enough to allow the organization to fight a bruising war against US and Iraqi armies for more than four years, maintain its internal cohesion during almost three years of reduced activity, and then send significant forces into Syria in 2013 while beginning to operate more aggressively at home. 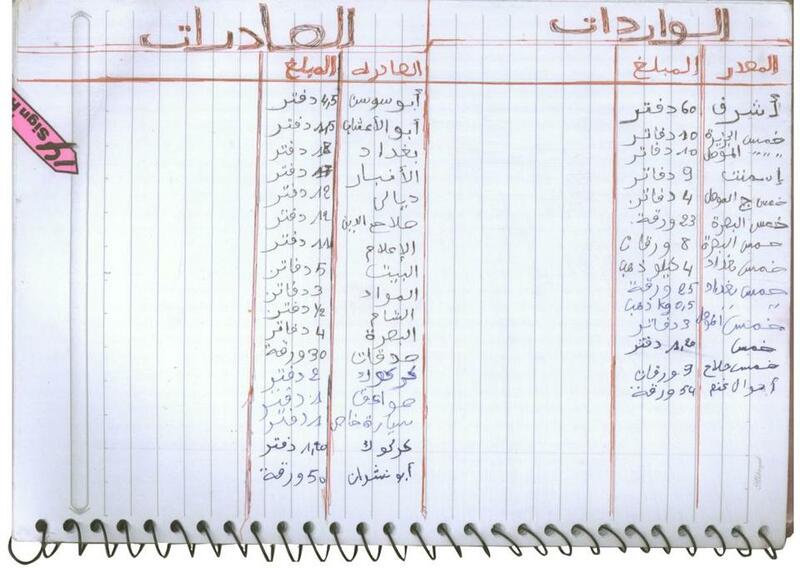 A notebook captured in Ninewa province in 2009 contains meeting notes, operational notes, and the short list of revenues and expenses pictured above. Through the documents, a clear picture emerges: ISI was structured as a classic multidivisional hierarchy, much the way a large corporation or a federal bureaucracy works. It had a central management structure with functions that were replicated at multiple lower geographic levels. As in most such organizations, each geographic unit had substantial autonomy, while the central office handled issues requiring coordination, such as allocating personnel or money. Here’s what we found when it came to how the group managed revenues, expenditures, and the inevitable corruption faced by any large organization. TERROR WITH AN H.R. DEPARTMENT: An ISI spreadsheet captured in 2008 recorded personnel information for more than 1,000 members. Columns translate roughly as “Sequence Number,” “Name,” “Marital Status,” “Children,” “Women,” “Rent Amount” (extra payments some members got each month), and “Bail,” which refers to the monthly salary everyone received. The conventional counterterrorism wisdom for some time has been that extremist groups are funded largely by deep-pocketed donors and foreign states. Perhaps the most interesting thing the ISI’s finances tell us is that insurgent groups do not need such external backers if they can figure out ways to tax the local economy. The documents show that the ISI shifted from a reliance on petty crime (stealing and fencing cars, for example) in 2005-06, to more sophisticated mafia-style protection rackets in 2007-08, to direct involvement in oil production and smuggling in 2009-10. At no point do the group’s internal documents show substantial revenue from donors. In fact, the group’s own internal analysis explicitly noted that relying on external backers gives donors leverage over the organization and so should be avoided if possible. This is critical to understand, not only because it points us away from traditional methods of cutting off terrorists’ money supply, but because of what it tells us about the IS itself. Any group that levies taxes has to offer something in return. And there is no evidence that the IS is unusually good at public service provision. The implication is that the group is unlikely to be able to effectively raise revenues in the areas it controls over the long run—at least not without diverting its military forces to coercive taxation. PADDED PAYROLL? 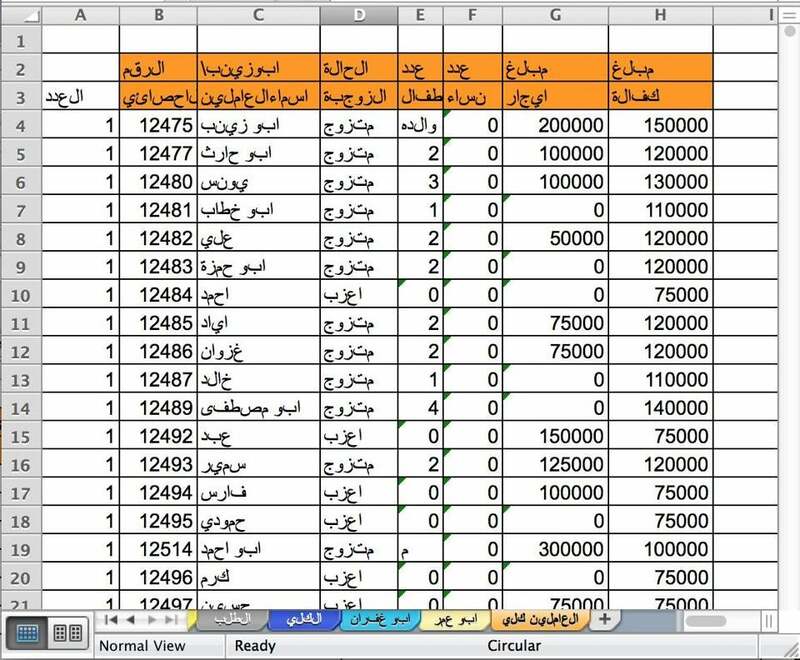 A personnel tracking spreadsheet from Mosul, captured early in 2009, shows that martyred fighters had approximately 20 percent more children on average; because the group paid extra for bigger families, this could mean unit leaders were inflating claims to pad their payrolls. The documents we analyzed contain a great deal of evidence that the ISI had a well-developed payroll system with clearly defined salaries. The ISI’s pay scale was quite egalitarian. In 2006, fighters were paid a flat wage of 60,000 Iraqi dinars a month, $41 at the time, with an additional allowance of roughly 30,000 for each spouse or other adult dependent in their household and 15,000 for each dependent child. Some appear to have received additional payments if they maintained a house for the group to use. There was no distinction in the payroll between positions, and we found little evidence that more senior members earned more. They did not have highly paid executives, at least not officially. What is odd is that the ISI did not pay any of its members competitive wages. Overall, the monthly wage for the average ISI fighter in 2007 was less than half what the average illiterate Iraqi male reported earning. It was even less than what the average unemployed person reported cobbling together from odd jobs. Other aspects were strange as well: For a normal employer, pay tends to be higher for riskier jobs; in this case it was reversed, and in fact, pay was often lower in places with higher levels of fighting and during periods when combat was more intense. This suggests that the ISI’s employees found a different kind of value in their work. Nonmonetary compensation—fighting for a cause they believed in, for example—must have been a big part of the package. By analogy, the ISI was less like a startup company than a “mission-driven organization” such as a nonprofit. This suggests that whatever conflicts it has with the local population, getting its members to give up the cause will be hard. As banal as it sounds, even true believers need to be paid back when they incur expenses. And just as at a normal company, getting reimbursed required paperwork, or at least it required that your boss tracked what he gave out. Despite its excellent recordkeeping, ISI was notably vague about what, exactly, was being expensed. One administrative spreadsheet covering expenses in Anbar governorate from Jan. 31, 2006, to Oct. 20, 2006, included line items such as 6,400 Iraqi dinars for “Reimbursement pay to Abu Abd Al Kadir” on April 9, and 4,270 Iraqi dinars to one “Imad” for “Expenses of the Administrative Committee” on June 3. A document tracking a range of expenses incurred by the Borders Emirate in early 2007 (a unit operating near the town of Sinjar on the Iraq/Syria border) included 20,000 Iraqi dinars for “Business expense to Abu-‘Ubaydah” and 45,000 Iraqi dinars paid to one Abu-Ahmad for a “clutch plate.” We have not found any official documentation on what the allowable expenses were—and it’s hard to know when a “clutch plate” refers to the actual car part, or is used as a code word for something else. What is clear is that the group didn’t hand out money lightly. It required records on who got money, and when. While the ISI didn’t have a health plan, at least not that we encountered, it did appear to cover medical expenses for certain members—and, again, it insisted on documentation. At one point a unit named the Umar Ibn Al Khattab Platoon requested reimbursement for 120,000 Iraqi dinars in medical expenses for their commander’s family’s medical needs. The note to the sector administrator requesting these funds was signed by no fewer than four individuals: a platoon commander, his local administrator, the sector commander, and the sector administrator who apparently approved it. If that seems like a great deal of work for basic expense reimbursement, the evidence we found suggests the ISI was worried about exactly the same thing as any organization: corruption and self-dealing. Despite its low salaries, the ISI had a policy of continuing to pay the families of martyred fighters, a form of life insurance that could be quite expensive. The larger the family, the more money went to the family upon the fighter’s death. At one point an ISI administrator who operated under the pseudonym of Abu Zayd checked how many dependents his cell leaders were reporting for the average active fighter, and how many the average deceased fighter had. His Excel calculations suggested that deceased fighters systematically had more dependents. One possibility, of course, is that married fighters took on higher risks than fighters without families. But another is that some cell leaders were padding the payroll by claiming extra dependents for their martyred fighters, and although we don’t know for sure, this seems the most likely explanation. Similarly, Abu Zayd’s predecessor as Mosul administrator made notes in his payroll tracking spreadsheet to investigate whether an ISI cell was collecting salaries of “ghost” fighters who existed on paper only. The ISI’s records help explain how its leaders created durable management institutions that enabled it to survive massive personnel losses, high senior leadership turnover, and huge shifts in local politics. However, they also point to some substantial deficiencies. The group’s financing tactics, relying on extortion and criminal rackets, put it directly in conflict with local economic elites. The group was also plagued by poorly disciplined fighters. In early 2006, for example, the group’s leadership council took a unit leader in Ramadi to task for killing members of the nascent Awakening council in public, and instructed him to conduct future killings more discreetly. Moreover, the way it managed human resources and finances—requiring numerous signatures and oversight—reflected high levels of internal mistrust. At one point in late 2008, an ISI manager who used the pseudonym As’ad suggests that the organization undertake some reforms, separating financial duties into different offices “to minimize the problem of embezzlement and fraud.” Apparently even committed jihadis need fiscal oversight. All this has two implications for current policy towards the IS. The positive implication is that the group’s expansion potential is ultimately limited. This formal structure and recordkeeping generate a steady stream of inside information traveling via e-mail, phone, and courier, which its opponents can intercept and exploit. The bigger the group gets, and the more people it tries to coordinate, the more it needs to communicate and share information internally—and the more it risks exposure. That weak spot has been a prominent flaw of terrorist groups historically, and it was one that helped the United States and its allies to beat back the ISI the first time. Of course such intelligence vulnerabilities can only be exploited by opponents who have the analytical and military capacity to take advantage of them. That capacity is currently lacking in much of Iraq and Syria. But such capacity is certainly present on the borders of Islamic State territory in Turkey and the Shia areas of Iraq, and so its expansion is bounded. A MULTIDIVISIONAL HIERARCHY: An org chart captured in 2007 shows the sector-level administrative structure for the ISI in Anbar Province. Under the sector emir, the document lists the medical emir, propaganda emir, sharia emir, administrative emir, security emir, and military emir. Thus the ultimate lesson of our analysis is that defeating groups like ISIS is a political task. No matter how effectively Iraqi forces and their allies use leaked information, they are unlikely to defeat the group until the people in IS-controlled territories feel they have a stake in being part of Iraq. That feeling of political inclusion was an important part of the equation when the United States and allies suppressed the ISI the first time. If that invitation to participate in the country’s future is sustained this time, as opposed to being allowed to wither as it was after US forces left, then the Sunni areas of Iraq may finally be able to free themselves of this violent, criminal bureaucracy. Danielle F. Jung is an assistant professor of political science at Emory University. Jacob N. Shapiro, author of “The Terrorist’s Dilemma: Managing Violent Covert Organizations,” is an associate professor of politics and international affairs at Princeton University. Pat Ryan and Jon Wallace of Praescient Analytics contributed to the analysis underlying this piece. Correction: Because of a production error, an earlier version of this story incorrectly described a noteboook captured in Ninewa province in 2009.